The cathode ray tube (CRT), invented by German physicist Karl Ferdinand Braun in 1897, is an evacuated glass envelope containing an electron gun (a source of electrons) and a fluorescent screen, usually with internal or external means to accelerate and deflect the electrons. When electrons strike the fluorescent screen, light is emitted. The electron beam is deflected and modulated in a way which causes it to display an image on the screen. The image may represent electrical waveforms (oscilloscope), pictures (television, computer monitor), echoes of aircraft detected by radar, and so forth. The single electron beam can be processed in such a way as to display moving pictures in natural colors. The generation of an image on a CRT by deflecting an electron beam requires the use of an evacuated glass envelope which is large, deep, heavy, and relatively fragile. The development of imaging technologies without these disadvantages has caused CRTs to be largely displaced by flat plasma screens, liquid crystal displays, DLP, OLED displays, and other technologies. The inverse process can be used to create an electronic version of an image impinging on a suitable screen in the video camera tube: Electrons are emitted by the photoelectric effect; the resulting electrical current can be processed to convey the information, later to be recreated on a CRT or other display. The earliest version of the CRT was a cold-cathode diode, a modification of the Crookes tube with a phosphor-coated screen, sometimes called a Braun tube. The first version to use a hot cathode was developed by John B. Johnson (who gave his name to the term, "Johnson noise") and Harry Weiner Weinhart of Western Electric, and became a commercial product in 1922. The cathode rays are now known to be a beam of electrons emitted from a heated cathode inside a vacuum tube and accelerated by a potential difference between this cathode and an anode. The screen is covered with a phosphorescent coating (often transition metals or rare earth elements), which emits visible light when excited by high-energy electrons. The beam is deflected either by a magnetic or an electric field to move the bright dot to the required position on the screen. In television sets and computer monitors, the entire front area of the tube is scanned systematically in a fixed pattern called a raster. An image is produced by modulating the intensity of the electron beam with a received video signal (or another signal derived from it). In all CRT TV receivers except some very early models, the beam is deflected by magnetic deflection, a varying magnetic field generated by coils (the magnetic yoke), driven by electronic circuits, around the neck of the tube. 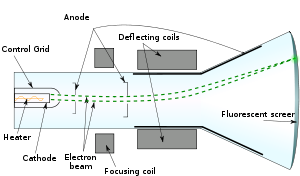 The source of the electron beam is the electron gun, which produces a stream of electrons through thermionic emission, and focuses it into a thin beam. The gun is located in the narrow, cylindrical neck at the extreme rear of a CRT and has electrical connecting pins, usually arranged in a circular configuration, extending from its end. These pins provide external connections to the cathode, to various grid elements in the gun used to focus and modulate the beam, and, in electrostatic deflection CRTs, to the deflection plates. Since the CRT is a hot-cathode device, these pins also provide connections to one or more filament heaters within the electron gun. When a CRT is operating, the heaters can often be seen glowing orange through the glass walls of the CRT neck. The need for these heaters to "warm up" causes a delay between the time that a CRT is first turned on, and the time that a display becomes visible. In older tubes, this could take fifteen seconds or more; modern CRT displays have fast-starting circuits which produce an image within about two seconds, using either briefly increased heater current or elevated cathode voltage. Once the CRT has warmed up, the heaters stay on continuously. The electrodes are often covered with a black layer, a patented process used by all major CRT manufacturers to improve electron density. The electron gun accelerates not only electrons but also ions present in the imperfect vacuum (some of which result from outgassing of the internal tube components). The ions, being much heavier than electrons, are deflected much less by the magnetic or electrostatic fields used to position the electron beam. Ions striking the screen damage it; to prevent this, the electron gun can be positioned slightly off the axis of the tube so that the ions strike the side of the CRT instead of the screen. Permanent magnets (the ion trap) deflect the lighter electrons so that they strike the screen. Some very old TV sets without an ion trap show browning of the center of the screen, known as ion burn. The aluminum coating used in later CRTs reduced the need for an ion trap. When electrons strike the poorly-conductive phosphor layer on the glass CRT, it becomes electrically charged, and tends to repel electrons, reducing brightness (this effect is known as "sticking"). To prevent this the interior side of the phosphor layer can be covered with a layer of aluminum connected to the conductive layer inside the tube, which disposes of this charge. It has the additional advantages of increasing brightness by reflecting towards the viewer light emitted towards the back of the tube, and protecting the phosphor from ion bombardment. For use in an oscilloscope, the design is somewhat different. Rather than tracing out a raster, the electron beam is directly steered along an arbitrary path, while its intensity is kept constant. Usually the beam is deflected horizontally (X) by a varying potential difference between a pair of plates to its left and right, and vertically (Y) by plates above and below, although magnetic deflection is possible. The instantaneous position of the beam will depend upon the X and Y voltages. It is most useful for the horizontal voltage to repeatedly increase linearly with time until the beam reaches the edge of the screen, then jump back to its starting value (sawtooth waveform, generated by a timebase). This causes the display to trace out the Y voltage as a function of time. Many oscilloscopes only function in this mode. However it can be useful to display, say, the voltage versus the current in an inductive component with an oscilloscope that allows X-Y input, without using the timebase. The electron gun is always centered in the tube neck; the problem of ion production is either ignored or mitigated by using an aluminized screen. The beam can be moved much more rapidly, and it is easier to make the beam deflection accurately proportional to the applied signal, by using electrostatic deflection as described above instead of magnetic deflection. Magnetic deflection is achieved by passing currents through coils external to the tube; it allows the construction of much shorter tubes for a given screen size. Circuit arrangements are required to approximately linearise the beam position as a function of signal current, and the very wide deflection angles require arrangements to keep the beam focussed (dynamic focussing). In principle, either type of deflection can be used for any purpose; but electrostatic deflection is best for oscilloscopes with relatively small screens and high performance requirements, while a television receiver with a large screen and electrostatic deflection would be many meters deep. Some issues must be resolved when using electrostatic deflection. Simple deflection plates appear as a fairly large capacitive load to the deflection amplifiers, requiring large current flows to charge and discharge this capacitance rapidly. Another, more subtle, problem is that when the electrostatic charge switches, electrons which are already part of the way through the deflection plate region will only be partially deflected. This results in the trace on the screen lagging behind a rapid change in signal. Extremely high performance oscilloscopes avoid these problem by subdividing the vertical (and sometimes horizontal) deflection plates into a series of plates along the length of the "deflection" region of the CRT, and electrically joined by a delay line terminated in its characteristic impedance; the timing of the delay line is set to match the velocity of the electrons through the deflection region. In this way, a change of charge "flows along" the deflection plate along with the electrons that it should affect, almost negating its effect on those electrons which are already partially through the region. Consequently the beam as seen on the screen slews almost instantly from the old point to the new point. In addition, because the entire deflection system operates as a matched-impedance load, the problem of driving a large capacitive load is mitigated. It is very common for oscilloscopes to have amplifiers which rapidly chop or swap the beam, blanking the display while switching. This allows the single beam to show as two or more traces, each representing a different input signal. These are properly called multiple-trace (dual trace, quadruple trace, and so on) oscilloscopes. Much rarer is the true dual beam oscilloscope, whose tube contains an electron gun that produces two independent electron beams. Usually, but not always, both beams are deflected horizontally by a single shared pair of plates, while each beam has its own vertical deflection plates. This allows a time-domain display to show two signals simultaneously. Many modern oscilloscope tubes pass the electron beam through an expansion mesh. This mesh acts like a lens for electrons and has the effect of roughly doubling the deflection of the electron beam, allowing the use of a larger faceplate for the same length of tube envelope. The expansion mesh also tends to increase the "spot size" on the screen, but this trade off is usually acceptable. When displaying one-shot fast events the electron beam must deflect very quickly, with few electrons impinging on the screen, leading to a faint or invisible display. A simple improvement can be attained by fitting a hood on the screen against which the observer presses his face, excluding extraneous light, but oscilloscope CRTs designed for very fast signals give a brighter display by passing the electron beam through a micro-channel plate just before it reaches the screen. Through the phenomenon of secondary emission this plate multiplies the number of electrons reaching the phosphor screen, giving a brighter display, possibly with a slightly larger spot. The phosphors used in the screens of oscilloscope tubes are different from those used in the screens of other display tubes. Phosphors used for displaying moving pictures should produce an image which fades very rapidly to avoid smearing of new information by the remains of the previous picture; that is, they should have short persistence. An oscilloscope will often display a trace which repeats unchanged, so longer persistence is not a problem; but it is a definite advantage when viewing a single-shot event, so longer-persistence phosphors are used. An oscilloscope trace can be any color without loss of information, so a phosphor with maximum effective luminosity is usually used. The eye is most sensitive to green: for visual and general-purpose use of the P31 phosphor gives a visually bright trace, and also photographs well and is reasonably resistant to burning by the electron beam. 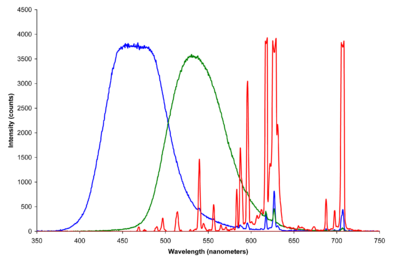 For displays meant to be photographed rather than viewed, the blue trace of P11 phosphor gives higher photographic brightness; for extremely slow displays, very-long-persistence phosphors such as P7, which produce a green trace followed by a longer-lasting amber or yellow afterimage, are used. The phosphor screen of most oscilloscope tubes contains a permanently-marked internal graticule, dividing the screen using Cartesian coordinates. This internal graticule allows for the easy measurement of signals with no worries about parallax error. Less expensive oscilloscope tubes may instead have an external graticule of glass or acrylic plastic. Most graticules can be side-illuminated for use in a darkened room. Oscilloscope tubes almost never contain integrated implosion protection. External implosion protection must always be provided, either in the form of an external graticule or, for tubes with an internal graticule, a plain sheet of glass or plastic. The implosion protection shield is often colored to match the light emitted by the phosphor screen; this improves the contrast as seen by the user. Close-up of the shadow mask of a 15-inch CRT monitor, showing the cursor. 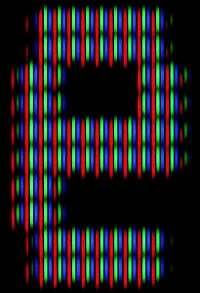 Close-up of the aperture grille of a 25-inch television monitor, displaying the letter "e" of a teletext page. Graphical displays for early computers used vector monitors, a type of CRT similar to the oscilloscope but typically using magnetic, rather than electrostatic, deflection. Here, the beam traces straight lines between arbitrary points, repeatedly refreshing the display as quickly as possible. Vector monitors were also used by some late-1970s to mid-1980s arcade games such as Asteroids. Vector displays for computers did not noticeably suffer from the display artifacts of Aliasing and pixelization, but were limited in that they could display only a shape's outline (advanced vector systems could provide a limited amount of shading), and only a limited amount of crudely-drawn text (the number of shapes and/or textual characters drawn was severely limited, because the speed of refresh was roughly inversely proportional to how many vectors needed to be drawn). 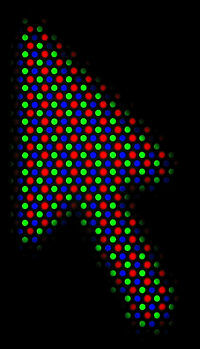 Some vector monitors are capable of displaying multiple colors, using either a typical tri-color CRT, or two phosphor layers (so-called "penetration color"). In these dual-layer tubes, by controlling the strength of the electron beam, electrons could be made to reach (and illuminate) either or both phosphor layers, typically producing a choice of green, orange, or red. Other graphical displays used "storage tubes," including Direct View Bistable Storage Tubes (DVBSTs). These CRTs inherently stored the image, and did not require periodic refreshing. Some displays for early computers (those that needed to display more text than was practical using vectors, or that required high speed for photographic output) used Charactron CRTs. These incorporate a perforated metal character mask (stencil), which shapes a wide electron beam to form a character on the screen. The system selects a character on the mask using one set of deflection circuits, and selects the position to draw the character at using a second set. The beam is activated briefly to draw the character at that position. Graphics could be drawn by selecting the position on the mask corresponding to the code for a space (in practice, they were simply not drawn), which had a small round hole in the center; this effectively disabled the character mask, and the system reverted to regular vector behavior. Many of the early computer displays used "slow," or long-persistence, phosphors to reduce flicker for the operator. While it reduces eyestrain for relatively static displays, the drawback of long-persistence phosphor is that when the display is changed, it produces a visible afterimage that can take up to several seconds to fade. This makes it inappropriate for animation, or for real-time dynamic information displays. Color tubes use three different phosphors which emit red, green, and blue light respectively. They are packed together in strips (as in aperture grille designs) or clusters called "triads" (as in shadow mask CRTs). 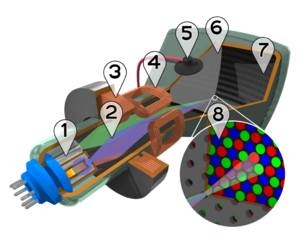 Color CRTs have three electron guns, one for each primary color, arranged either in a straight line or in a triangular configuration (the guns are usually constructed as a single unit). Each gun's beam reaches the dots of exactly one color; a grille or mask absorbs those electrons that would otherwise hit the wrong phosphor. Since each beam starts at a slightly different location within the tube, and all three beams are perturbed in essentially the same way, a particular deflection charge will cause the beams to hit a slightly different location on the screen (called a "subpixel"). Color CRTs with the guns arranged in a triangular configuration are known as delta-gun CRTs, because the triangular formation resembles the shape of the Greek letter delta. Dot pitch defines the "native resolution" of the display. On delta-gun CRTs, as the scanned resolution approaches the dot pitch resolution, moiré (a kind of soft-edged banding) appears, due to interference patterns between the mask structure and the grid-like pattern of pixels drawn. Aperture grille monitors do not suffer from vertical moiré, however, because the phosphor strips have no vertical detail. The outer glass allows the light generated by the phosphor out of the monitor, but (for color tubes) it must block dangerous X-rays generated by high energy electrons impacting the inside of the CRT face. For this reason, the glass is leaded. Color tubes require significantly higher anode voltages than monochrome tubes (as high as 32,000 volts in large tubes), partly to compensate for the blockage of some electrons by the aperture mask or grille; the amount of X-rays produced increases with voltage. Because of leaded glass, other shielding, and protective circuits designed to prevent the anode voltage from rising too high in case of malfunction, the X-ray emission of modern CRTs is well within approved safety limits. CRTs have a pronounced triode characteristic, which results in significant gamma (a nonlinear relationship between beam current and light intensity). In early televisions, screen gamma was an advantage because it acted to compress the screen contrast. However in systems where linear response is required (such as when desktop publishing), gamma correction is applied. The gamma characteristic exists today in all digital video systems. CRT displays accumulate a static electrical charge on the screen, unless preventive measures are taken. This charge does not pose a safety hazard, but can lead to significant degradation of image quality through attraction of dust particles to the surface of the screen. Unless the display is regularly cleaned with a dry cloth or special cleaning tissue (using ordinary household cleaners may damage anti-glare protective layer on the screen), after a few months the brightness and clarity of the image drops significantly. The high voltage (EHT) used for accelerating the electrons is provided by a transformer. For CRTs used in televisions, this is usually a flyback transformer that steps up the line (horizontal) deflection supply to as much as 32,000 volts for a color tube (Monochrome tubes and specialty CRTs may operate at much lower voltages). The output of the transformer is rectified and the pulsating output voltage is smoothed by a capacitor formed by the tube itself (the accelerating anode being one plate, the glass being the dielectric, and the grounded (earthed) Aquadag coating on the outside of the tube being the other plate). Before all-glass tubes, the structure between the screen and the electron gun was made from a heavy metal cone which served as the accelerating anode. Smoothing of the EHT was then done with a high voltage capacitor, external to the tube itself. In the earliest televisions, before the invention of the flyback transformer design, a linear high-voltage supply was used; because these supplies were capable of delivering much more current at their high voltage than flyback high voltage systems, in the case of an accident they proved extremely deadly. The flyback circuit design addressed this; in the case of a fault, the flyback system delivers relatively little current, making a person's chance of surviving a direct shock from the high voltage anode lead more hopeful (though by no means guaranteed). CRT screens have much deeper cabinets compared to LCD screens for a given area, however, they can display higher resolutions on a smaller screen. Also, LCD have worse color rendition due to the fluorescent tubes used as back light, even though they can be brighter overall. The result is that CRT are useful for displaying photos with a high pixels per unit area and correct color balance, and for having large desktop area concentrated into a small screen. Having 1600 by 1200 resolution in 18" 4:2 rather then 20-24" on most LCD also allows less eye movement to view different parts of the screen. However, the end of most high-end CRT production in the mid 2000s (including high-end Sony, NEC, and Mitsubishi product lines) means an erosion of the CRT's capability. In addition to offering high-resolutions in a smaller screen area, they offer the resolutions more cheaply for a given resolution. In general, rear-projection displays and LCDs require less power per display area, but plasma displays consume as much as or more than CRTs. However, color CRTs still find adherents in computer gaming due to their high refresh rates and higher resolution per initial cost. CRT's are also still popular in the printing and broadcasting industries as well as in the professional video, photography, and graphics fields due to their greater color fidelity and contrast, better resolution when displaying moving images, and better view from angles, although improvements in LCD technology increasingly alleviate these concerns. The demand for CRT screens is falling rapidly, and producers are responding to this trend. For example, in 2005 Sony announced that they would stop the production of CRT computer displays. Similarly, German manufacturer Loewe ceased production of CRT TVs in December 2005. It has been common to replace CRT-based televisions and monitors in as little as 5-6 years, although they generally are capable of satisfactory performance for a much longer time. This trend is less progressed in television CRT displays. Due to the high cost of large LCD panels and plasma displays, a market niche for CRTs still exists as a cheaper alternative to these technologies. However, this situation is rapidly changing. In the United Kingdom, the largest retailer of domestic electronic equipment, DSG (Dixons) reported that CRT models made up 80-90 percent of the volume of televisions sold at Christmas 2004 and only 15-20 percent a year later, and that they were expected to be less than 5 percent at the end of 2006. Dixons have announced that they will cease selling CRT televisions in 2007. Magnets should never be put next to a color CRT, as they may cause magnetization of the shadow mask, and in severe cases can permanently distort it mechanically, which will cause incorrect colors to appear in the magnetized area. This is called a "purity" problem, because it affects the purity of one of the primary colors, with the residual magnetism causing the undesired deflection of electrons from one gun to the wrong color's phosphor patch. This can be expensive to have corrected, although it may correct itself over a few days or weeks. Most modern television sets and nearly all newer computer monitors have a built-in degaussing coil, which upon power-up creates a brief, alternating magnetic field which decays in strength over the course of a few seconds (typically, the decay is implemented with a specialized resistor in the circuit which increases resistance with its increasing temperature as a result of the current passing through it). The coil's interaction with the shadow mask, screen band, and chassis components is the reason for the characteristic "hum" associated with turning on many CRT-equipped displays. This degaussing field is strong enough to remove most cases of shadow mask magnetization. It is possible to purchase or build an external degaussing coil, which can aid in demagnetizing older sets, or in cases where the built-in coil is ineffective. A transformer, which produces a large alternating magnetic field (one can typically be found in soldering guns, though not soldering irons), may also be used to degauss a monitor, by holding it up to the center of the monitor, activating it, and slowly moving the gun in ever wider concentric circles past the edge of the monitor until the shimmering colors can no longer be seen (if a soldering gun is being used, ensure that the hot tip is facing away from the glass and the user). To see the shimmering colors clearly, you may need to display a white or light-colored screen. This process may need to be repeated several times to fully remove severe magnetization. In extreme cases, very strong magnets such as the now popular neodymium iron boron, or NIB magnets, can actually deform (and likely, permanently bend) the shadow mask. This will create an area of impure color rendition on the screen and if the shadow mask has been bent, such damage usually can't be repaired. Subjecting an old black and white television or monochrome (green or amber screen) computer monitor to magnets is generally harmless; this can be used as an effective demonstration tool for seeing the immediate and dramatic effect of a magnetic field on moving charged particles. Electromagnetics: Some believe the electromagnetic fields emitted by CRT monitors constitute a health hazard to the functioning of living cells. Exposure to these fields diminishes according to the inverse square law, which describes the propagation of all electromagnetic radiation: Double the distance, quarter the power; monitor and television manuals typically recommend a minimum viewing distance of 85 cm (34 in). The EM energy is also less intense for the display's user than for a person located behind it, because the deflection yoke is closer to the rear. It is well-known that electromagnetic waves of sufficient energy can harm human cells (as is the case in ionizing radiation), but it is not currently well-established that the weaker radiation commonly emitted by electronic devices (including CRTs) has long-term health effects. Ionizing radiation: CRTs emit a small amount of X-ray band radiation as a result of the electron beam's bombardment of the shadow mask/aperture grille and phosphors. Almost all of this radiation is blocked by the thick leaded glass in the screen, so the amount of radiation escaping the front of the monitor is widely considered harmless. The Food and Drug Administration regulations in 21 CFR 1020 are used to strictly limit, for instance, television receivers to 0.5 milliroentgens per hour (mR/h) (0.13 µC/(kg•h) or 36 pA/kg) at a distance of 5 cm from any external surface; most CRT emissions fall well below this limit. Early color television receivers (many of which are now highly collectible) were especially vulnerable due to primitive high voltage regulation systems. X-ray production is generally negligible in black-and-white sets (due to low acceleration voltage and beam current), and in virtually every color display since the late 1960s, when systems were added to shut down the horizontal deflection system (and therefore high voltage supply) should regulation of the acceleration voltage fail. All television receivers and CRT displays equipped with a vacuum tube based high voltage rectifier or high voltage regulator tube also generate X-rays in these stages. These stages are universally housed in a metal enclosure called the "high voltage cage" to substantially reduce (and effectively eliminate) exposure. As examples, a 1B3 and a 6BK4 vacuum tube would be installed inside this metal enclosure. For both X-ray and electrical safety reasons, the set should never be operated with the cover of the high voltage cage opened. Toxins: CRTs may contain toxic phosphors, although this is very uncommon in modern CRTs; breaking the glass envelope could release these toxins. Also, because of the X-ray hazard, the glass envelopes of most modern CRTs are made from heavily leaded glass, which may represent an environmental hazard, especially in the presence of acid rain leaking through landfills. Indirectly heated vacuum tubes (including CRTs) use barium compounds and other reactive materials in the construction of the cathode and getter assemblies; normally this material will be converted into oxides upon exposure to the air, but care should be taken to avoid contact with the inside of all broken tubes. In some jurisdictions, discarded CRTs are regarded as toxic waste. Flicker: The constant refreshing of a CRT can cause headaches in migraine sufferers and seizures in epileptics, if they are photosensitive. Screen filters are available to reduce these effects. A high refresh rate (above 75 Hz) also helps to negate these effects. High voltage: CRTs operate at very high voltages, which can persist long after the device containing the CRT has been switched off and/or unplugged, sometimes for years. Residual charges of hundreds of volts can also remain in large capacitors in the power supply circuits of the device containing the CRT; these charges may persist. Modern circuits contain bleeder resistors, to ensure that the high-voltage supply is discharged to safe levels within a couple of minutes at most. These discharge devices can fail even on a modern unit and leave these high voltage charges present. Voltmeter should be rated at 32,000 + volts to measure this high voltage presence. It is likely that a special voltmeter will be needed, as most common ones don't read voltages that are in that range. Those working inside CRT-containing equipment should know how and be able to safely discharge these hazards. In particular, the large rubber connector which looks like a suction cup is responsible for supplying accelerating voltage to the bell of the CRT. Under the suction cup is the ultor, which couples the accelerating voltage to the inside of the tube. Inside the glass bell is a coating of metallic paint, while the outside of the bell is coated with a conductive graphite coating called Aquadag; between the ultor's connection to the flyback transformer and the Aquadag, there is therefore a capacitance capable of maintaining the full accelerating voltage for weeks. While this accelerating voltage is high (typically from 7 kilovolts (kV) to 50 kV depending on screen size, monochrome or color, direct view or projection), both the capacitance and flyback current are small (on the order of picofarads and nanoamperes respectively), so shocks from the accelerating voltage are typically embarrassing and painful but usually harmless. On the other hand, the voltages and available currents used in the deflection and power supply circuits can result in instantaneous death. Carrying a CRT with the screen away pointed away and gun end pointed at the chest is the most dangerous way to hold it. The high voltage, if still stored in the tube, could travel from the arms at the CRT face to the gun end of the tube, right into the chest. Implosion: All CRTs and other vacuum tubes operate under high vacuum so that air and gas molecules will not interfere with electron streams. CRTs have large viewing areas and proportionally larger bells required to accommodate the deflection of the electron beams to the rear of the screen. As a result, these highly evacuated glass bulbs have a large surface area, with each and every square inch exposed to atmospheric pressure. The larger the CRT, the more surface area, the more total exterior air pressure load. Therefore, CRTs present an implosion hazard when mishandled. While a great deal of research has gone into implosion protective designs for CRTs, all CRTs present this risk to some degree. Early television receivers even included a "safety glass" to protect viewers from flying glass due to spontaneous structural failures of the CRT; with modern (early 1960s onward) banded and bonded-face CRTs, the safety glass has become redundant. Safety goggles, leather gloves, and heavy sweaters are considered indispensable safety equipment amongst experienced technicians and preservationists of early television equipment. Because of the strong vacuum within a CRT, they store a large amount of mechanical energy; they can implode very forcefully if the outer glass envelope is damaged. The fragments of glass accelerated by the implosion force can bounce off each other or miss and wind up flying out the other side of the tube. Therefore the implosion becomes an explosion of glass and other parts of the tube. Even with a chain vest you can still get scars to show from this event. (Specifically, from working on a powered set from behind the tube when it imploded.) Most modern CRTs used in televisions and computer displays include a bonded, multi-layer faceplate that prevents implosion if the faceplate is damaged, but the bell of the CRT (back portions of the glass envelope) offers no such protection. Certain specialized CRTs (such as those used in oscilloscopes) do not even offer a bonded faceplate; these CRTs require an external plastic faceplate or other cover to render them implosion safe while in use. Before the use of bonded faceplates, one of the hazards was that a broken neck or envelope could cause the electron gun to be propelled at such a velocity that it would erupt through the face of the tube. Unmounted CRTs should always be carried "face" down, using both hands, and by grasping the tube under the face, wrapping the hands around the sides where the metal mounting frame is attached. It is important never to carry a CRT by the neck! For added safety, carrying the tube in a closed, thick box or with a thick cloth wrapped around it (but not in such a way as to impair one's grip on the tube) is a good idea; this will reduce the amount of flying debris should the tube break. Large tubes (over 19 inches) should be carried by two people. When handling or disposing of a CRT, certain steps must be taken to avoid creating an implosion hazard. The most simple and safe method to make the tube safe is to identify the small sealed glass nib at the far back of the tube (this may be obscured by the electrical connector) and then (while wearing safety glasses and gloves) filing a small nick across this and then to break it off using a pair of pliers. A loud sucking sound will be heard as the air enters the tube, filling the vacuum. Once the vacuum is filled, the tube is destroyed, but it cannot implode. In October of 2001, the Environmental Protection Agency created rules for disposing of CRTs in the United States, stating that CRTs must be brought to special recycling centers. In November of 2002, the EPA began fining companies that disposed of CRTs through landfills or incineration. Regulatory agencies, local and statewide, monitor the disposal of CRTs and other computer equipment. In Europe, disposal of CRT televisions and monitors are covered by the WEEE Directive. ↑ CNET, The basics of TV power. Retrieved January 13, 2007. ↑ London Evening Standard, The future is flat as Dixons withdraws sale of "big box" televisions. Retrieved December 3, 2006. Compton, Kenneth. 2003. Image Performance in CRT Displays. Bellingham, WA: SPIE: ISBN 0819441449. Dahl, Per F. 1997. Flash of the Cathode Rays: A History of J J Thomson's Electron. Oxford: Taylor & Francis. ISBN 0750304537. Heilbron, John L. 2003. The Oxford Companion to the History of Modern Science. New York: Oxford University Press. ISBN 0195112296. Samuel M. Goldwasser TV and Monitor CRT (Picture Tube) Information. History of "Cathode ray tube"
This page was last modified on 19 January 2017, at 16:30.